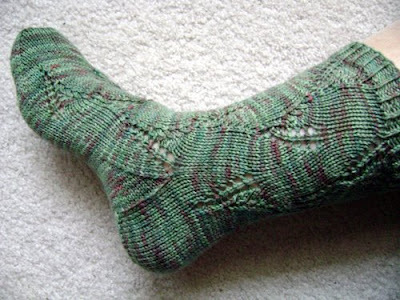 spillyjane knits: Free sock pattern -- this week only! I've never had something seem like a good idea this early on a Sunday morning, but here goes. I was thinking about Mokira, what I consider to be one of my prettiest sock patterns, and how it seems to have flown under the collective consciousness for whatever reason. Anyway, I'd like to try to change that, at least a little. I'd love to see other knitters making and enjoying these quick and easy socks! So! For one week only, (22 February until 28 February 2009,) Mokira will be offered as a free(!) download, available both here on Ravelry and here on my blog. After this week, it's back up to $6.00 USD. Grab it while you can! Thank you! And you are right, I have never seen this pattern before! February 22, 2009 at 9:27 a.m. I just know I will love love love it! Thanks again and have a blessed sunday! February 22, 2009 at 10:36 a.m.
February 22, 2009 at 11:31 a.m.
February 22, 2009 at 11:46 a.m.
thank you! i've never seen it before either and don't know how i missed it. February 22, 2009 at 3:12 p.m.
thanks for this pattern. it's great! now to decide what yarn to use. February 24, 2009 at 2:09 p.m.
You are such a speed demon spillyjane! Every time I turn around you have another beautiful pattern tempting me! February 24, 2009 at 6:47 p.m.
February 25, 2009 at 7:01 p.m.
aww, missed out on the freebie. Just found the pattern on Ravelry. It is really a nice one. March 6, 2009 at 11:38 a.m.